Beautiful! I love your description of the encounter. I agree with the above poster. You could write children’s books! 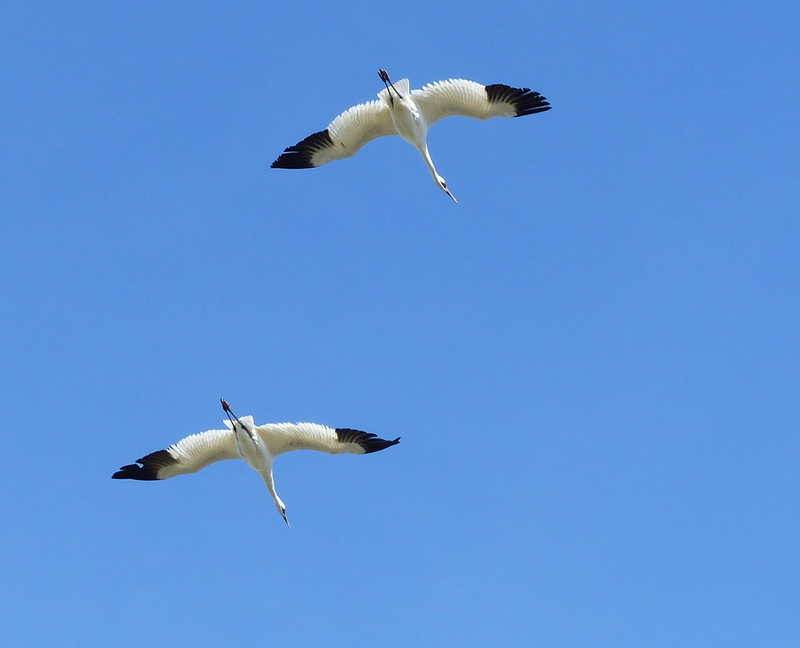 Actually, in this post, you kind of DID write a non-fiction style children’t book teaching about whooping cranes – for a reading level where they just want a few sentences per page and a picture. All beautiful, but I do love that first shot! Thank you. That photo is one of my favorites and turned out better than I thought it would. Birds are never easy to photograph. I’ve always known you as a birder. Highly highly impressive captures! And what fun and actually inspiring post! Thanks Sheila. 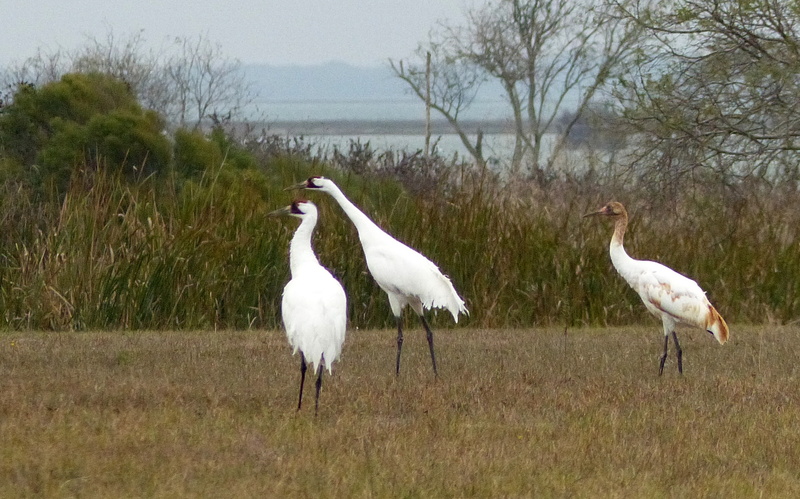 The whooping cranes are quite impressive in person and are actually responsible for my interest in bird photography. I’m certainly not a birder but do appreciate the beauty of our feathered friends. They are indeed and quite the treat to see them in the wild. Ingrid, your photos of the whoopers are amazing! They are such magnificent birds and you captured them beautifully — including in flight, which is challenging. We biked from Goose Island SP to see a family of three whoopers every day when we were staying in Rockport several years ago. I wonder if we were seeing some of the same birds that you’ve been seeing? I hope so. It makes me happy to know that they’re making a comeback from the brink of extinction. Thank you Laurel and I’m pretty sure some of the birds you saw are still around. Just yesterday I photographed nine whoopers hanging together…. nine! Very exciting to see so many. They are the instigators in my interest in bird photography which started last year when I first got introduced to these gorgeous birds. Thank you for sharing Ingrid. I learned something new. They are truly beautiful birds. 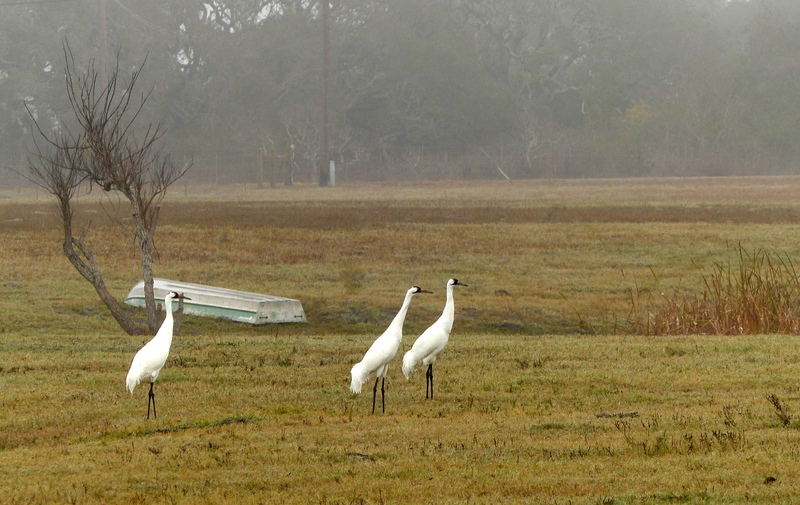 Watching Whooping Cranes hang out with Sandhills is beyond my wildest dream. We were fortunate to have five Sandhills fly right over us in Northern Wisconsin in September. Other than that, I’ve only seen them taxidermied in Visitor Centers. This post lifted my heart. Thanks. Hope you are feeling better. Feeling crappy on the road is no fun. I’m doing much better, thank you. I can’t even begin to count the number of sandhill cranes around here. Quite often the whoopers hand out with the sandhills. We’re thinking about a Midwest trip this summer and that would include a visit to the International Crane Foundation in Baraboo WI. I’ll be using your blog for U.P. ideas. Thank you for sharing your wonderful experience and beautiful photographs of these wonderful birds. 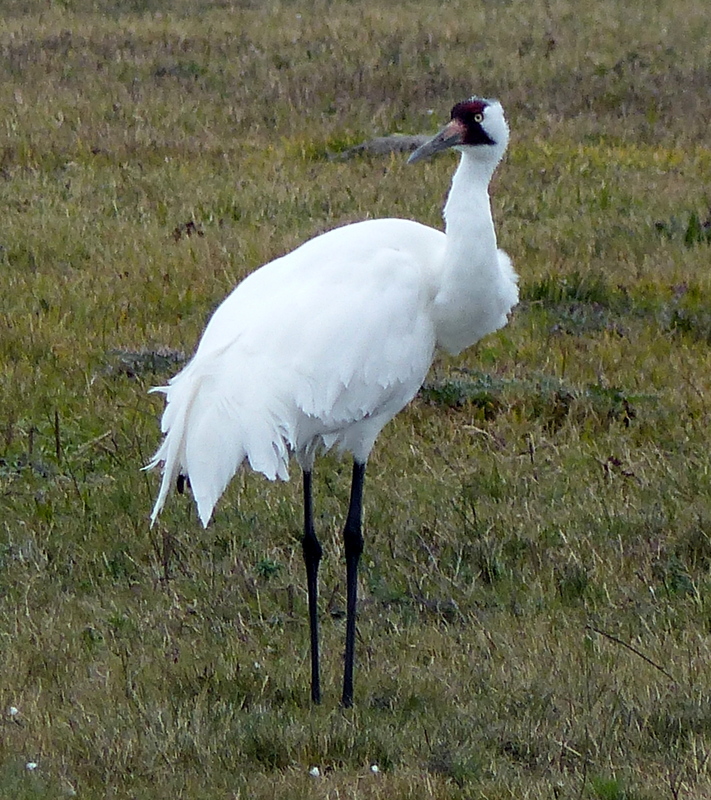 Whooping cranes are simply amazing. Thank you for stopping by and commenting. What wonderful captures Ingrid! You are becoming quite the birder. Hope you are now feeling better. Really enjoyed your narrative and shots of these guys. I didn’t realize there were so few of them. We have several Sandhill’s at the campground here in South FL. Thank you Larry and yes they are rare. In the 1940’s there were less than 20 remaining so it’s very exciting to see their population grow. I had no idea how large they are! Now you’ve got me so curious…what is killing them off. So totally beautiful…thanks for sharing! Thank you Ingrid. I just sent you a friend request and check out the video. 🙂 I hope you don’t mind but I shared your blog entry on our Facebook page and a few other places. I’m sure craniacs around North America will enjoy it. Sorry to hear you’re not feeling well Ingrid. These captures are amazing! 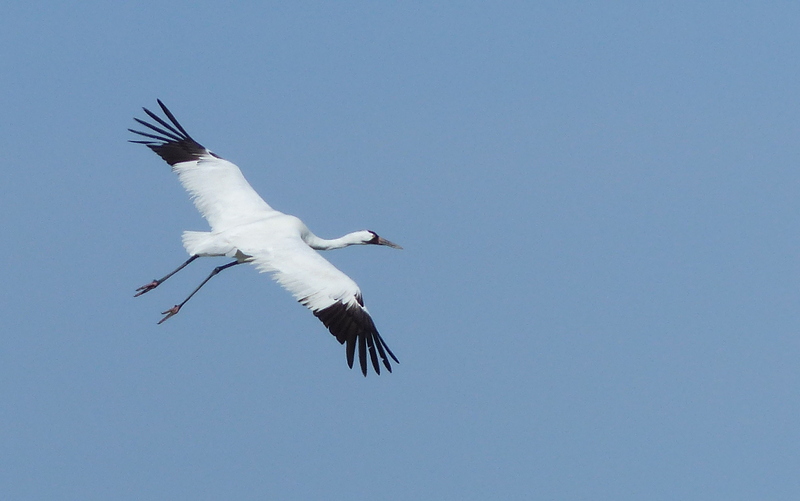 I had no idea we had whooping cranes flying this far north. Off to share this post on Twitter. So cool. Awe, thanks Sue. 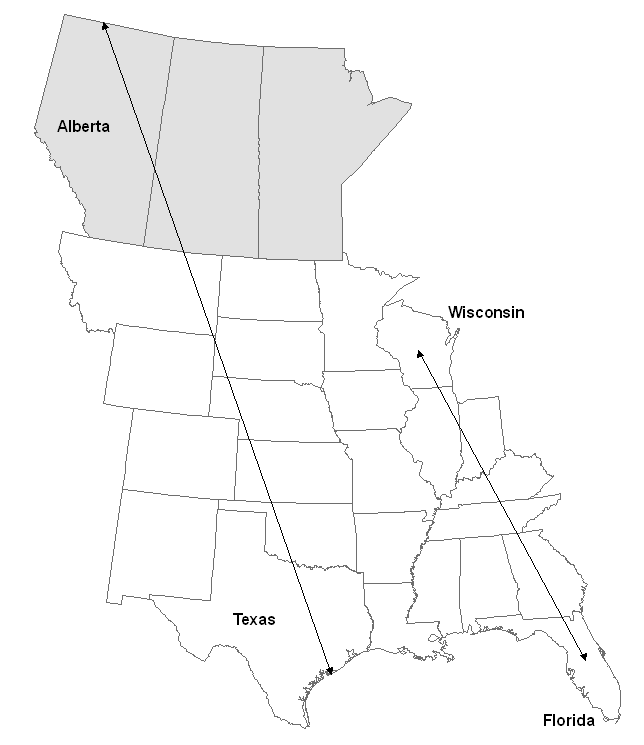 I need to do a little research on the Wood Buffalo NP as a possible summer destination for us. Could be an interesting excursion. Unfortunately, this summer will have us returning to the Midwest to visit with family. Thus, a trip to Canada will need to wait. Amazing birds, I saw some at a bird sanctuary in Florida doing their mating dance – crazy! So glad you’re enjoying them in the wild. Yes, they are amazing. That mating dance is quite something. I saw a little of it last winter. I never tire observing these beautiful birds. So this is what we call SNOWBIRDS!! Beautiful photos! Feel better !! Haha, yes the original snowbirds you could say. Once this weather warms I should start feeling lots better – thanks. Thanks Pam, they are incredible birds to see in person AND to hear them. Did you watch my video on Facebook? I can’t seem to post the video on WordPress plus it wasn’t the greatest video either but at least you can hear them. Haha… Yes the original snowbirds. That is quite the trek. It would be fun to follow their route sometime. I am in total awe! I may just come knocking on your door one of these days so we can go out together to experience these wonderful and rare creatures. A family has been spotted up here in northern TX area, but I have not had the privilege so far. What fantastic beautiful pictures, and such a privilege to see such stunning rare birds. We didn’t see them last time we visited Texas. 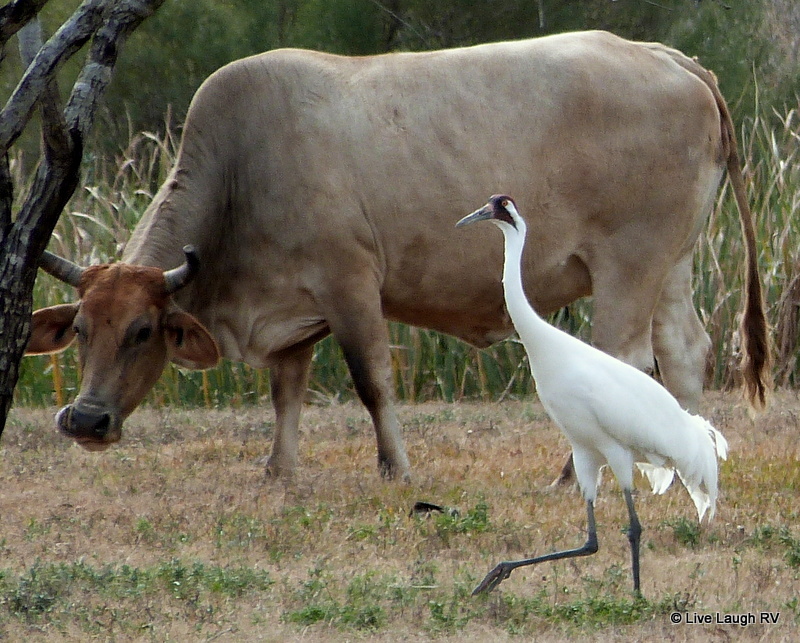 We know all about Sandhill Cranes – got a dozen visiting our yard every day (they love whole corn). Thank you Pam. Several of the yards around the neighborhood here have large feeders which attract the Sandhills and the Whoopers and I’m assuming it’s corn. I love the sound the cranes make and can hear them almost every morning in the distance. They make up for the cold weather we’ve been having. Thank you for sharing your stunning photos! 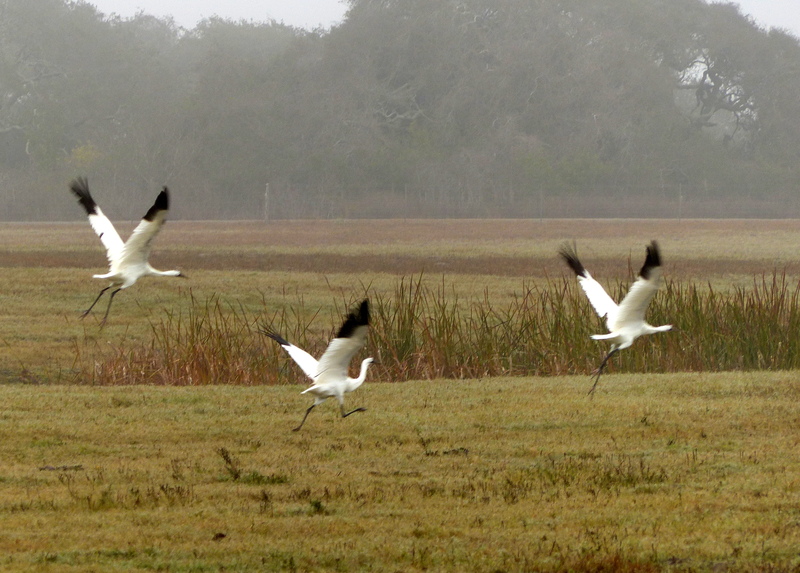 We are headed that way in late February and hoping to have a chance to see the Whooping Cranes. Do you mind sharing where you are camping? 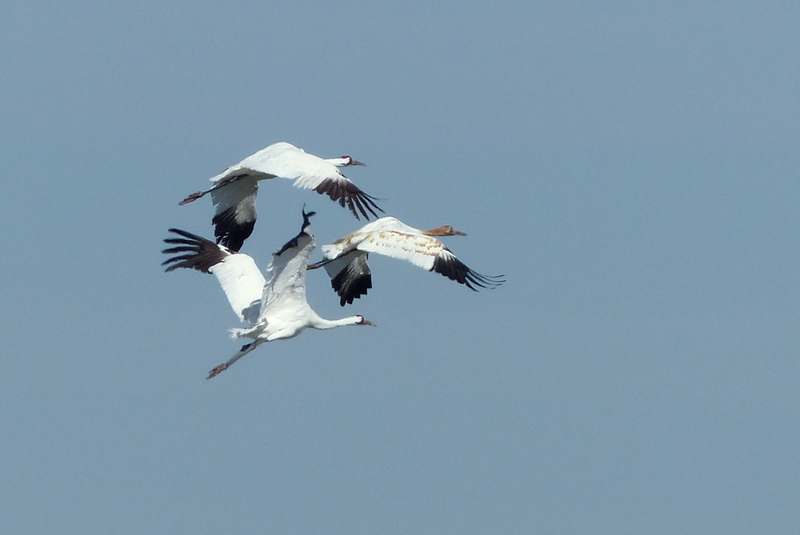 Awesome pictures, I have seen a lot of Sandhills but despite being from Wisconsin have yet to see a Whooping Crane. Sandhills are a well populated bird where as Whoopers are rare. 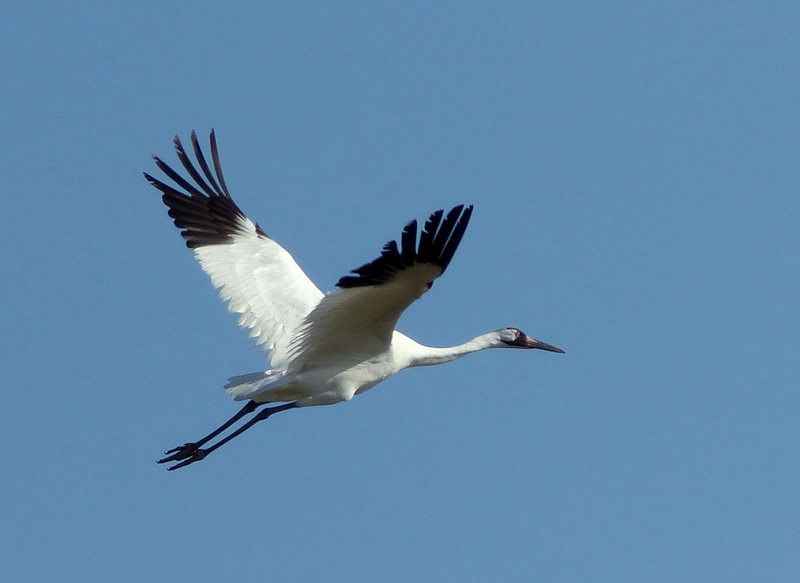 I’m hoping to visit the International Crane Foundation in Baraboo this summer. We’ll visit my dad first in northern IL then head up into WI and visit friends and the cranes. Beautiful photos of beautiful birds. I love the story of the Dad and the teenagers. I hope they are still around when we get there in March. Here’s hoping you feel better soon! Thank you and I’m not sure when they’ll start the journey north. There are some staying here year round. Feel free to email me if you’d like any information on the area. Sending you an email in a few minutes. Thanks so much! LOVE! LOVE!LOVE!…and…you are one brave woman to look UP at those birds overhead…You might have had to shampoo that beautiful hair an extra time …tehee. I was standing in the back of the truck (personal bird viewing platform) as they flew right over me…. amazing. Ah, the shampooing of the hair is no big deal. I’d be more concerned about the camera, but then again having to buy a new camera wouldn’t be so bad either. “Honey, I need a new camera because Mr. Whooper just pooed all over this one”. How do ya think the big guy would respond to that? LOL. Lovely pics Ingrid. I Googled ‘where in Florida do whoopers go’ (thinking they may winter near my brother) and what did I get? Burger King in Florida. Whoppers! Thanks Carol and I can always count on you for a good laugh. You are too funny. Love your beautiful photos! Feel better soon my friend. Thanks Mary. I captured a short video of the encounter as well. I love listening to them. Did you ever think of writing children’s books? You are such a great story writer. Awesome photos! I love the last capture! Having been to the International Crane Foundation really made me understand and appreciate these beauties. Despite the weather you managed to do a great job of watching and capturing their habits and grace. Enjoy them while you can, for you are so privilege for camping near them.